Home Tips What is Vulkaninfo? If you are reading this article, you may have noticed something peculiar on your computer screen, something that has appeared seemingly without your approval. It may look like a normal icon to you, or you may wonder how on the earth it has entered your machine. There have been many searches about Vulkaninfo, so we believe it is a topic that may interest a great number of our readers. The following information will make Vulkaninfo 32 clearer to you and may answer any further questions that you might have. Vulkaninfo.exe represents a program that is generally found in the C:\Program Files address of your computer. Most commonly, it may be integrated in your system as a driver update by Nvidia, Intel or AMD. As a matter of fact Vulkaninfo 32 is just an extra component for graphic applications used by Vulkan SDK. The official statement of the company explains that Vulkan is a contemporary graphics and API platform, which is being currently developed by the Khronos consortium. The Vulkaninfo.exe file has recently been noticed by a lot of users as an additional separate application. However, it is important to note this component has been a part of the graphic drivers of Nvidia for a long time. Experts refer to the components of that type as API (application program interface). Actually, APIs include a set of routines, protocols, and tools for forming/developing software products. They help to explain exactly how software components interact and are used for creating graphic user interface (GUI) components. The Vulkan SDK represents a new, low level API, developed to make computer games run even more smoothly. That is why most GPU brand companies integrate Vulkan into their driver updates. 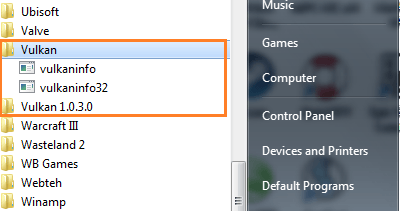 In case you have recently updated your graphic drivers, this is the reason why this component has appeared on your system and you can notice it on your start menu. To be completely honest, your system can function perfectly well without this program using only the Direct X API. However, in this case you would probably be unable to run the Vulcan API at all. Does Vulkaninfo represent a possible threat to your system? Now we will answer the most common question among the searches for Vulkaninfo online. In general, when your anti-malware tool performs a virus scan, it is not supposed to detect any dangerous code in this component. What may actually annoy the users, though, is that vulkaninfo.exe usually installs itself without asking the user in advance and sometimes may cause some kind of a chaos in their Start menu. What’s more, a new malware might be hiding somewhere there under the same name or inside the Vulkaninfo.exe. One of the methods to determine what our case really is is to check if the executable bears the digital signature of LunarG. If it doesn’t, then you certainly have a reason to worry. Please, note that this doesn’t represent an essential system process. However, it should not affect your system performance as a whole, when it is not in use. If it happens that this process is activated in spite of not using the API (for work or pleasure- most often computer games), then it will be wise to look at it. Under other circumstances, we do not recommend that you uninstall this exe and its associated files from your system. What are you supposed to do if your anti-malware tool flags VulkanInfo? If it is not possible to verify the genuine developer of this component, it is likely that this application might be fake or even malicious. A reliable antivirus will help you detect if there is a real danger encoded in the file. If you seek advice on what to do, we will stay true to our golden tips for malware prevention and will recommend that you shouldn’t trust anything that appears in your system surprisingly and without your consent. Make sure that you do some research about everything that concerns your privacy. We will advise you, when possible, to not keep unknown and strange programs on your PC. Should you uninstall/remove VulkanInfo or not? Why something like that may happen is because vulkaninfo keeps records in your registry that try to direct the actions to already non-existing files. In such a case, it may be necessary that you track them down and manually delete them. Such actions may sometimes appear problematic, especially to inexperienced users. If you have noticed something wrong with this component, do not hesitate to share your problem with us in the comments below. Our “MobileSecurityZone” experts will make all the possible efforts to find out all about your issue and help you deal with it safely. Was this article helpful? Your thank–you comments are more than appreciated! Previous articleGozNym Malware – A Banking Trojan! Next articleIs WhatsApp’s Encryption More Reliable?